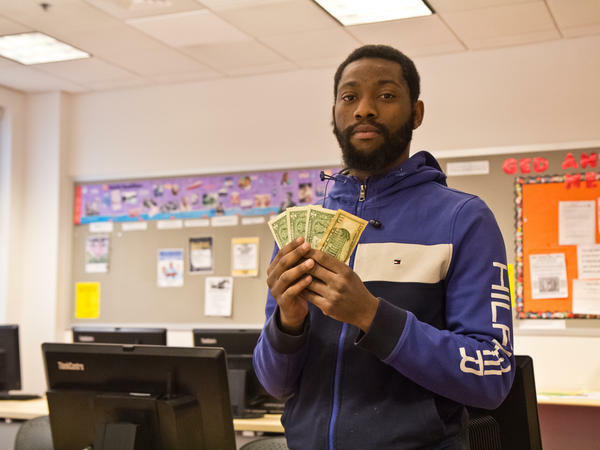 Philadelphia just became the first large city in the nation to ban cashless businesses in the city, in part to protect people like Dwight Tindal, a construction worker who doesn't have a bank or credit card. Updated Mar. 11, 5:23pm E.T. Back in December, the Philadelphia City Council passed "Fair Workweek" legislation, joining a growing national movement aimed at giving retail and fast-food workers more predictable schedules and, by extension, more predictable lives. Low-income residents and unions lobbied lawmakers and put the issue on their radar. Similar laws are on the books in New York, San Francisco and Seattle. That's typically how it works. Advocates shine a light on a problem. A bill gets introduced. That's not the way it worked with another new law in Philadelphia. That law can be traced back to one man: City Councilman Bill Greenlee. Last fall, Greenlee introduced a bill outlawing cashless businesses — brick-and-mortar shops and restaurants where customers can only pay with credit and debit cards. "I heard that there started to be some establishments in Center City. Something just didn't sit right with me on that," said Greenlee. Mayor Jim Kenney signed it into law last week, making Philadelphia the first big city in the country to ban cash-free stores. It takes effect July 1. But anti-poverty advocates say cashless businesses weren't a concern before Greenlee introduced his bill. Many support the bill, but they didn't point out the problem to Greenlee, nor did they lobby for it. The veteran lawmaker thought it was discriminatory for businesses to turn away low-income residents who don't have bank accounts, a population collectively referred to as the "unbanked." "It just seems unfair to have that separation. It's almost like it's 'us' and 'them,' " said Greenlee. Nearly 13 percent of Philadelphia's population — close to 200,000 people — are unbanked, according to federal banking data. That's more than double the regional average. Philadelphia construction worker Dwight Tindal is one of them. He had a bank account a few years ago. He closed it because his balance never stayed above zero for very long. "I got a little baby – a son. And bills too. So, that go to all that," said Tindal. These days, the 24-year-old only uses cash. He keeps all his money in a secret location he doesn't share with anyone. He counts his stash two or three times a day, every day. And only takes out what he knows he needs. The rest stays hidden. Tindal said it's a stressful system. "I'm concerned every day ... I just think 'dang, I should move it here' or 'I should move it over here'," said Tindal. Still, he's not offended by the handful of businesses in the city that only accept cards, including Sweetgreen and Bluestone Lane, fast casual chains that sell built-to-order salads and coffee, respectively. That's problematic for Otis Bullock, executive director of Diversified Community Services, but not because he thinks unbanked Philadelphians should be more outraged. To him, the silence shows City Council missed the mark. "I would have liked to see a measure that more directly impacted poor people as far as getting them out of poverty. You know, a measure that raises their income. Or, at a minimum, a measure that addresses the actual issue, which is those who experience financial insecurity becoming unbankable," said Bullock. Greenlee admits the genesis of his bill was unconventional. He sees value in it nonetheless. "We can do this bill much quicker than I think we're gonna solve the problem of the unbanked," said Greenlee. "If there comes a time in a few years where everybody has the same ability to use some kind of credit, debit, plastic in some way, then fine, maybe this law wouldn't be necessary anymore. But that's not the case now." The law not only forces existing cashless businesses to change course but also stops new ones from going that route in the future. Kerry Smith, a staff attorney with Community Legal Services, said that safeguard is critical for the future. She's concerned that retailers that offer basic staples such as toiletry items and food may begin to turn away people with cash. "That's gonna have a significant impact on low-income individuals in Philadelphia," said Smith. Amazon, for example, is rolling out a network of cashless stores called Amazon Go, which sell "ready-to-eat breakfast, lunch, dinner and snack options," as well as "grocery essentials"
A Sweetgreen spokesman declined comment. Nicholas Stone, founder and CEO of Bluestone Lane, didn't respond to calls and emails requesting comment on Greenlee's legislation. In an interview last year, Stone told NPR that he made Bluestone cash-free because the overwhelming majority of the company's customers never paid in cash. Stone also said lines move faster when employees don't have to make change for customers who pay in cash. The Chamber of Commerce for Greater Philadelphia opposed the bill, complaining in a letter to City Council that banning cashless businesses might discourage local entrepreneurs from setting up shop in the city. "Passing such a measure will allow local government to dictate how entrepreneurial business owners will operate versus customers deciding not to shop there," wrote president Rob Wonderling. Andre Andrews, owner of Dre's Homemade Water Ice and Ice Cream, is also not a fan of the bill. His is a cash-free business that specializes in non-traditional ice cream flavors. Andrews sympathizes with the intent of the law, but he has a hard time getting past the fact that government is telling him how to operate. "I'm trying to keep up with the times," he says. "But you're forcing me to stay one-dimensional. My customers are OK with being cashless so I don't understand." New York and San Francisco, which each have dozens of cash-free businesses, are considering similar legislation. New Jersey needs the governor's signature to join Massachusetts as the only state that bans cashless businesses. Philadelphia is the first big city in the country to ban so-called cashless businesses - shops and restaurants that do not accept cash. Philadelphia probably won't be the last city, though. From member station WHYY in Philadelphia, Aaron Moselle reports on the new law. AARON MOSELLE, BYLINE: This is not a complicated law. Whether you sell sneakers or smoothies, customers must be able to pay in cash. Philadelphia City Councilman Bill Greenlee introduced the bill. He says, otherwise, businesses would be discriminating against low-income residents who don't have bank accounts, what's known as being unbanked. BILL GREENLEE: It seems like, on a regular, commercial establishment, people should be able to buy the product if they have the means to buy the product. It just seems unfair to have that separation. MOSELLE: It's estimated more than 10 percent of Philly's population - nearly 200,000 people - are unbanked. That's more than double the regional average. Construction worker Dwight Tindal is one of them. He had a bank account a few years ago. He closed it because his balance never stayed above zero for very long. DWIGHT TINDAL: I got a little baby - a son, boy. And then bills, too, so that go to all that. MOSELLE: These days, Tindal only uses cash. He keeps all of his money in a secret location. He says it's a stressful system. TINDAL: I'm concerned every day. I just think, like, dang, I should move it here, or I should move it over here. But if I don't be paranoid and just stick with the plan I had, everything will be cool. MOSELLE: Tindal isn't bothered by the handful of cashless businesses in the city. He says there are plenty of places that sell salads and coffee that accept cards and cash. He also says it's on him that he doesn't have a bank account, not the businesses. Anti-poverty advocates, even ones who support the bill, told me this issue wasn't on their radar either before the measure was introduced. MOSELLE: Otis Bullock leads the nonprofit Diversified Community Services. BULLOCK: ...You know, a measure that raises their income or, at a minimum, a measure that addresses the actual issue, which is those who experience financial insecurity becoming unbankable. MOSELLE: So why does Philly have this law? City Councilman Greenlee admits the idea started with him, not his unbanked constituents. GREENLEE: We can do this bill much quicker than I think we're going to solve the problem of the unbanked. MOSELLE: Kerry Smith is an attorney with Community Legal Services. The organization has a number of unbanked clients. She says Greenlee's law also serves as a safeguard, particularly if Philly stores selling basic staples go cashless. KERRY SMITH: Our clients may simply be shamed or embarrassed from being turned away from a store, or they may have to dig deeper into their pocketbooks to pay high fees for a prepaid card that they otherwise would not want simply so they can put food on the table and buy items that their family needs. MOSELLE: Philly's Chamber of Commerce was not a fan of the new law and neither is Andre Andrews, owner of Dre's Homemade Water Ice and Ice Cream. It's a cash-free business that specializes in non-traditional flavors. He sympathizes with the intent of the law, but he has a hard time getting past the fact that government is telling him how to operate. ANDRE ANDREWS: I'm trying to keep up with the times, but you're forcing me to stay one-dimensional. And my customers are OK with being cashless, so I don't understand. MOSELLE: Philly's law takes effect in July. New York and San Francisco are considering similar legislation. New Jersey just needs the governor's signature to join Massachusetts as the only places with a statewide ban of cashless businesses. For NPR News, I'm Aaron Moselle in Philadelphia. (SOUNDBITE OF LONE'S "OEDO 808") Transcript provided by NPR, Copyright NPR.